The official Twitter account of renowned Pakistani journalist Hamid Mir has been hacked by an unknown hacker who is now leaking screenshots of his personal emails. 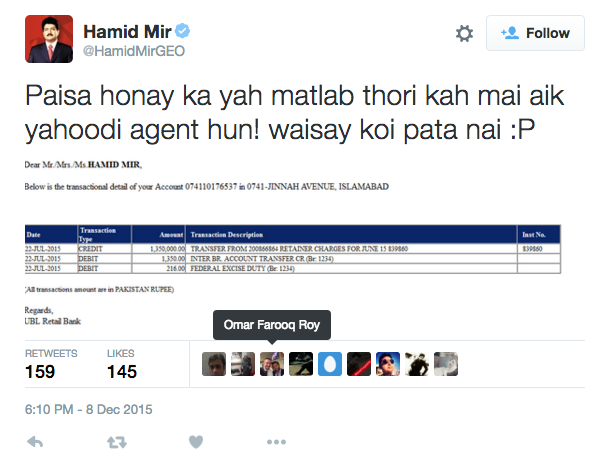 Hamid Mir, known for his journalist work and controversies has his Twitter account hacked and whoever is behind the hack is now leaking screenshots of Mir’s personal email and bank account. 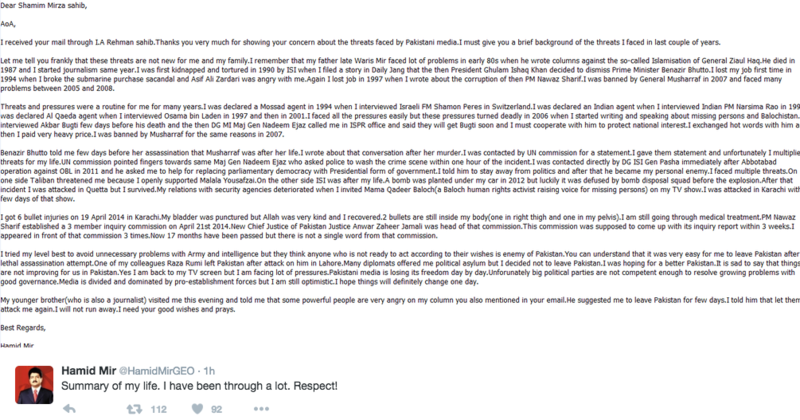 The hacker seems to have a pro-ISI stance as the leaked emails from Mir’s account shows a lot of anti-ISI content plus the hacker is angry over the Mir’s anti-ISI stance. The hacker also cracked jokes about Sushma Swaraj, the Minister of External Affairs of India who is currently in Pakistan to discuss bilateral ties and Afghanistan issue. 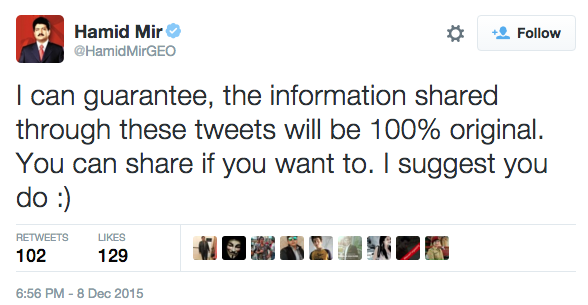 Mir currently works for Geo TV Network and has a huge following on Twitter with 1.67million followers. 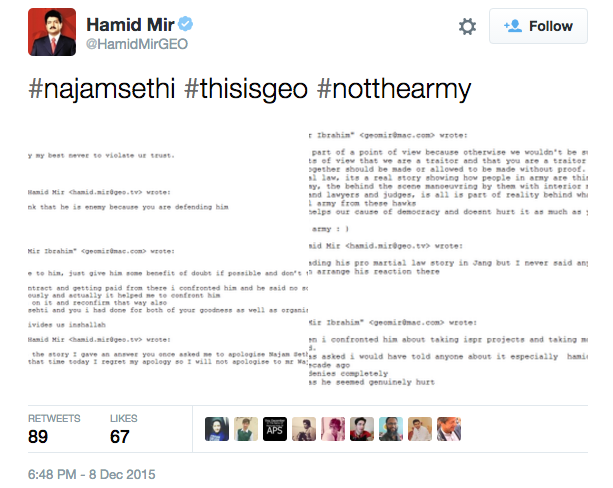 Confirming that Hamid Mir’s account has been hacked Director News Geo News Rana Jawad added that Mir’s mobile phones have been blocked to prevent access. 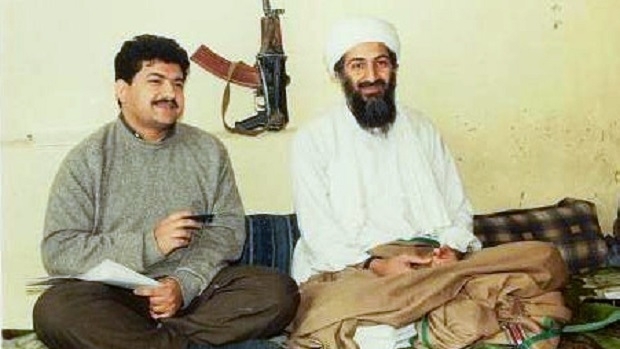 Hamid Mir gained popularity after meeting Osama Bin Ladin and investigating his escape from Tora Bora mountains in December 2001. Mir is also known for several controversies such as his views against Pakistani army veterans (DailyMotion Video) in Bangladeshi talk show. The former Pakistani President Musharaf declared Mir a Taliban sympathiser and banned his TV show for months. 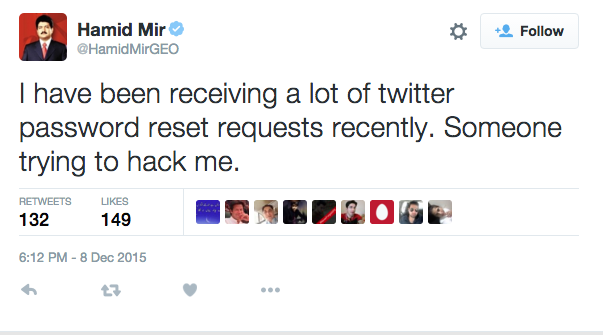 This is not the first time when a Pakistani journalist was hacked. In the past, the official website of famous Pakistani TV anchor Mubasher Lucman was also hacked.